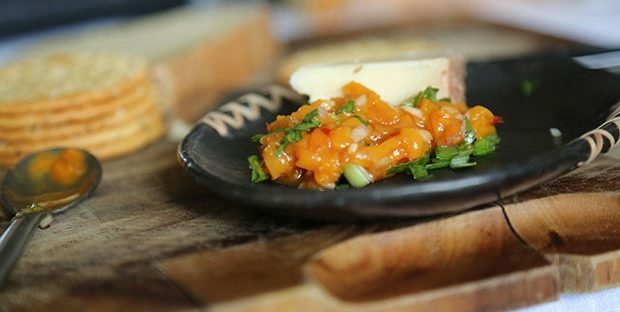 This dish is really a cross between a chutney and a salsa. You can make it entirely from peaches or apricots- whatever is available. fresh apricots tend to need more added sweetness while cooking so adjust accordingly with a little extra honey. It’s good with cheese and crackers, yum with tortilla chips or on tacos and great with roasted meat and grilled fish. 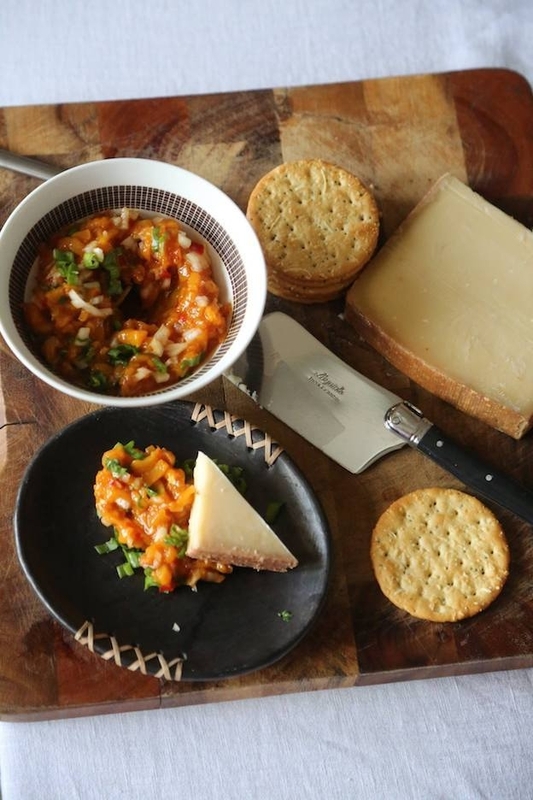 I use various red chilli pastes depending on what’s available – sriracha, habanero, sambal olek, tabasco original even the little containers of chilli sauce that come with Chinese take out! 1. Cook the apple juice, vinegar, chilli paste, zest and peaches or apricots in a pot over a low flame until soft and sticky but still chunky. 2. Remove from the flame and cool. 3. Adjust salt, sweet, sour and spiciness by adding vinegar, honey or chilli paste to suit your taste. If your peaches weren’t sweet to begin with you will probably need more honey. 4. Stir in onions and cilantro. Serve cold or at room temperature. Store for upto 3-4 days in an airtight container in the refrigerator. 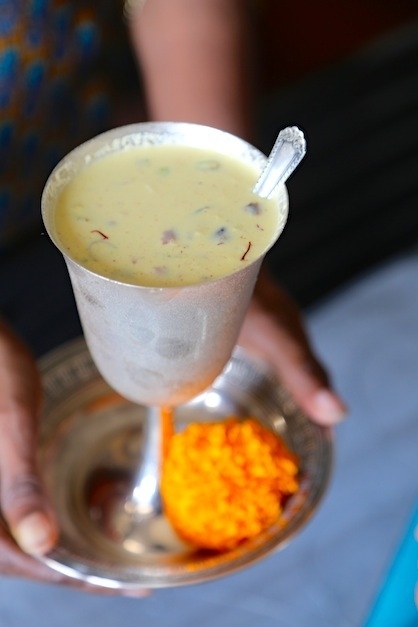 Also known as Dudh Ka Sharbat this refreshing, chilled, spiced drink is a good alternative to Mithai. You can also make it with semi skimmed or 2% milk for a lighter beverage and use a sugar substitute. Heat the milk and sugar on a low flame. While it reaches a boil grind together all the ingredients for the spice mix. Reserve. When the milk reaches a boil and the sugar has dissolved stir in the white pepper and cardamom. Switch off flame and stir in spice paste and mix well. Let rest 10 minutes. Using a fine sieve strain the mixture into a pitcher. Stir in nuts, powdered almonds and saffron. Taste for sweetness. Stir in more sugar if required. Chill 4-6 hours. Stir and serve cold in highball glasses, punch cups or goblets. THE GIFT JAR FEATURED IN THE PHOTO CONTAINS 100 GRAMS OF GRANOLA. THIS RECIPE CAN ALSO BE MADE IN SMALLER AND LARGER BATCHES. USE ONE OR ALL OF THE FOLLOWING BUT THE TOTAL MEASURE SHOULD BE 200 GRAMS. IF USING WHITE SESAME A TOTAL WEIGHT OF 25 GRAMS PER ONE KG OATS IS ADEQUATE. BE SURE TO CHECK WITH YOUR DOCTOR IF YOU HAVE AN ALLERGY TO CHIRONJI/CHAROLI. •	PREHEAT OVEN TO 350F. SET THE MIDDLE RACK. IF YOU DON’T HAVE AN OVEN USE A LARGE ANODIZED WOK OR 2 LARGE NON-STICK SKILLETS. •	YOU CAN DIVIDE THE INGREDIENTS INTO 2-3 BATCHES ALSO AND DO THEM ONE AT A TIME. THIS WILL MAKE IT EASIER TO STIR AND YOU CAN USE SMALLER COOKING POTS. 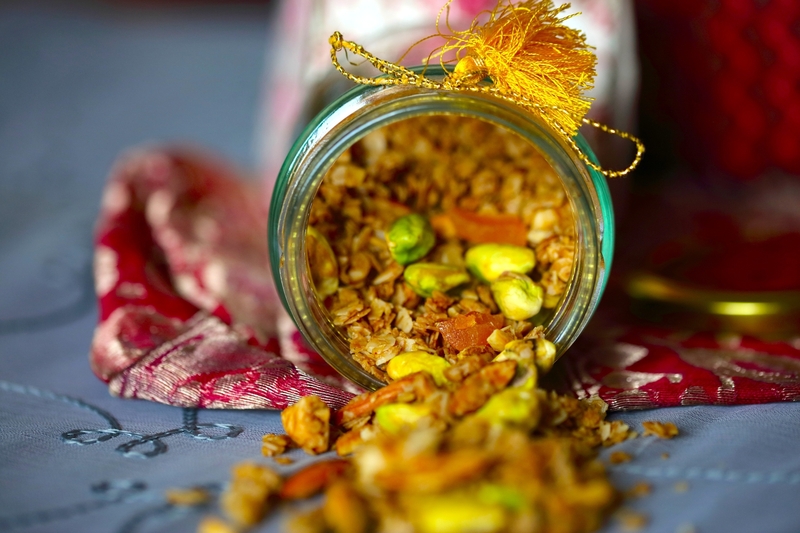 •	COMBINE THE OATS AND NUTS WITH THE OIL, SALT AND CARDAMOM IN A MIXING BOWL UNTIL WELL INCORPORATED. •	ADD THE HONEY AND MIX THROUGHLY. •	ENSURE THAT ALL THE OATS ARE COVERED WITH OIL AND HONEY. •	RACK UNTIL GOLDEN AND TOASTY ABOUT 25-30 MINUTES. •	AFTER 15 MINUTES OPEN OVEN DOOR, USE AN OVEN PROOF SPATULA AND SCRAPE THE GRANOLA, TURNING IT OVER TO ENSURE THAT ALL SIDES COOK EVENLY. •	IF COOKING ON A STOVE TOP, DIVIDE BETWEEN NON-STICK PANS AND ROAST OVER A SLOW FLAME. STIR REGULARLY TO PREVENT BURNING. •	REMOVE FROM THE OVEN OR OFF THE FLAME WHEN DONE. IMMEDIATELY STIR IN THE CRUSHED SAFFRON SO IT COOKS IN THE HEAT OF THE GRANOLA. TOSS WELL. ONCE GRANOLA HAS COOLED STIR IN THE APRICOTS. STORE IN AN AIRTIGHT CONTAINER IN THE FRIDGE IF YOU LIVE IN A HUMID CLIMATE. in northern Indian. This dal is slow cooked in milk to produce what I can best describe as a savory Dulce de Leche. 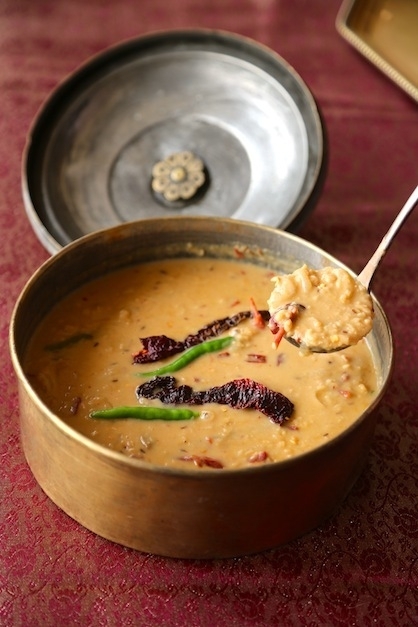 Or the sister dal of the famous Dal Makhani. I use half the milk and a third of the butter than other traditional versions. WASH THE LENTILS AND SOAK IN EXCESS WATER FOR AN HOUR. HEAT A TABLESPOON OF VEGETABLE OIL IN A LARGE COOKING POT. ADD ONIONS AND SAUTE UNTIL SOFT. ADD GARLIC AND GINGER PASTE AND SAUTE UNTIL FRAGRANT. DRAIN LENTILS AND ADD TO THE ONIONS. STIR WELL. ADD WATER AND MILK. ADD GREEN CHILLIES, RED CHILLI PIECES AND CLOVES OF GARLIC. STIR IN 1 TEASPOON SALT. COOK OPEN ON A SLOW FLAME , SCRAPE THE BOTTOM AND THE SIDES AS THE MILK CONDENSES. STIR FROM TIME TO TIME TO PREVENT BURNING. COOK UNTIL LENTILS ARE SOFT AND PULPY. THE COLOR WILL DARKEN TO THAT OF CONDENSED MILK. ADD MORE WATER IF REQUIRED. THE DAL MUST HAVE THE CONSISTENCY OF A CUSTARD. THIS COULD TAKE 2 HOURS. HEAT BUTTER OR GHEE IN SMALL SKILLET ON A MEDIUM FLAME. ADD CUMIN SEEDS AND COOK ONE MINUTE UNTIL SEEDS ARE FRAGRANT. ADD RED CHILLIES AND GREEN CHILLIES AND SAUTE UNTIL FRAGRANT. POUR OVER LENTILS AND STIR. SERVE HOT WITH FLATBREADS OR PLAIN WHITE RICE. Make the sauce and taste for tanginess. Adjust accordingly. Cover and reserve. Heat 2 teaspoons oil in a non stick skillet. Saute green onions until soft. Add garlic and ginger and saute again until fragrant. Switch of flame and cool. Combine soy sauce, hot sauce, 2 teaspoons of salt, and vinegar. Mash the peeled sweet potatoes manually with a potato ricer or a mashing tool- do not put it in a food processor. Mash until free of lumps. Remove any sweet potato fibers. Add the vinegar and soy sauce mixture and the cooled onions and garlic ginger and mash again until well incorporated. Add the processed bread and mash against until meal is evenly distributed. Taste for salt and spiciness. Adjust as per taste. Place the sesame seeds on a flat surface such as a cutting board. Dip balls very lightly into the cornflour mixture. You can use a pastry brush as well to lightly brush the balls with this sticky paste. Roll them in the sesame seeds and reserve on a plate. Heat 3 inches of oil in a small wok or kadai on high heat. When oil is hot (test by dropping a small piece of sweet potato into it-if its sizzles and rises to the top the oil is ready for frying) reduce flame to medium and add 4-5 balls at a time. Cool until golden, drain with a slotted spoon and then over old newspapers or kitchen towels until dry. Serve warm with cocktail picks or toothpicks and the dipping sauce. HEAT THE OIL IN A LARGE COOKING POT ON MEDIUM HEAT. SAUTE ONIONS UNTIL SOFT ABOUT 2 MINUTES. ADD GARLIC AND SAUTE UNTIL FRAGRANT. ADD PUMPKIN PIECES, STAR ANISE AND 3 CUPS OF WATER. ADD 2 TEASPOONS SALT AND CAYENNE OR PAPRIKA AND STIR WELL. 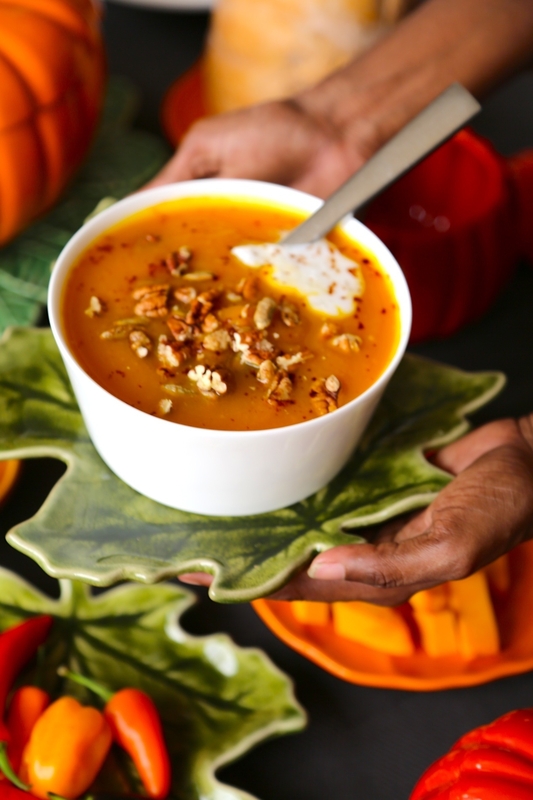 COOK UNTIL PUMPKIN SOFTENS AND MIXTURE THICKENS. STIR IN MILK AND COOK UNTIL PUMPKIN IS SOFT ENOUGH TO PUREE. REMOVE STAR ANISE AND DISCARD. COOL COMPLETELY AND THEN BLEND IN BATCHES TO A SMOOTH PASTE. RETURN TO COOKING POT. ADD ORANGE ZEST. ADD WATER TO THIN DOWN THE SOUP AS DESIRED. SIMMER UNTIL BUBBLY. STRAIN THROUGH A FINE SIEVE. DISCARD ZEST. TASTE FOR SEASONINGS. ADJUST SALT AND PAPRIKA. LADLE INTO 8 BOWLS. GARNISH WITH NUTS, SEEDS AND CREAM. SPRINKLE WITH A LITTLE CAYENNE OR PAPRIKA. In a dry skillet roast the chana dal about 2 minutes on a low flame. In the same dry skillet roast the all the ingredients for spice mix 2. Cool and grind to a smooth powder. Combine both spice mixes with the 2 teaspoons salt, garlic, ginger, tamarind, turmeric and chilli powder and grind again to form a smooth paste. Taste the spice mix for salt and adjust. It should be just a little salty before it is added to the eggplant. Wipe washed eggplants and using a sharp knife slice them from the bottom in the shape of a small cross. Keep the eggplant intact but cut deep enough to make room for the filling. Stuff each eggplant generously with 1.5 teaspoons of the spice paste and arrange on a plate. Add 1 cup of water to the remaining spice paste and stir well. Heat oil in a large shallow pan, preferably non stick. Add the onions and saute 1 minute until translucent on a medium flame. Add the eggplants one by one into the pan and saute on both sides about 1-2 minutes. Pour the spice mix and its water over the eggplants. Cook open until water evaporates, eggplants are tender and cooked through. Add more water if required during the cooking process. Adjust for salt, spice and sweetness. 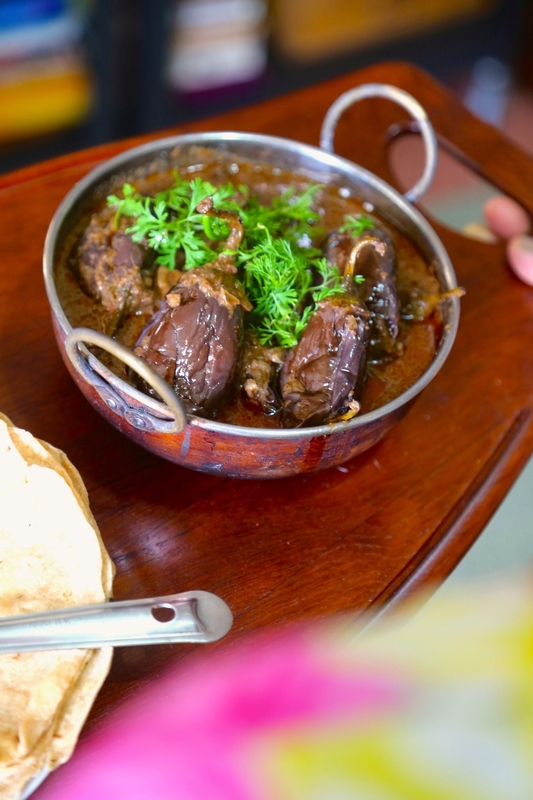 Garnish with coriander sprigs and serve hot with flatbreads. Grind all the ingredients for the chermoula to a smooth paste.Reserve. 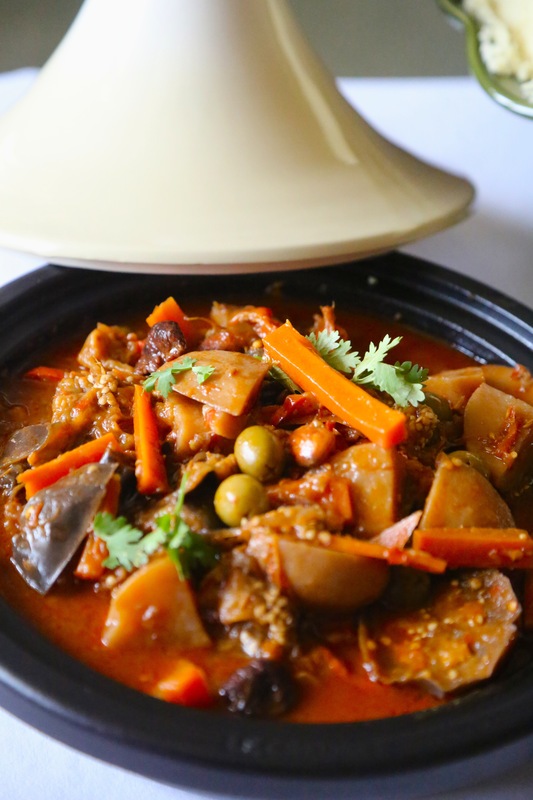 Heat olive on on a medium flame in a pressure cooker or tagine pot and saute onions until soft. Add ginger and saute again 2-3 minutes. Stir in the Chermoula spice paste and saute 30 seconds. Add drained chickpeas, 2 teaspoons of salt and one liter of water and pressure cooker for 3 whistles or cook in a covered tagine pot for 35 minutes on medium heat until tender. Add sweet potatoes and more water if required and cook 15 minutes on medium heat. and cook covered on a low flame for another 20-25 mins until vegetables are tender. Stir in the nuts, saffron, olives. Add more salt , cayenne and honey to your taste. Garnish with coriander leaves and serve warm with couscous. This delicious flatbread is made all over the western coast of India, but especially in Maharashtra and Karnataka. It is made from a Bhajanee- a combination of ground and lightly roasted flours. 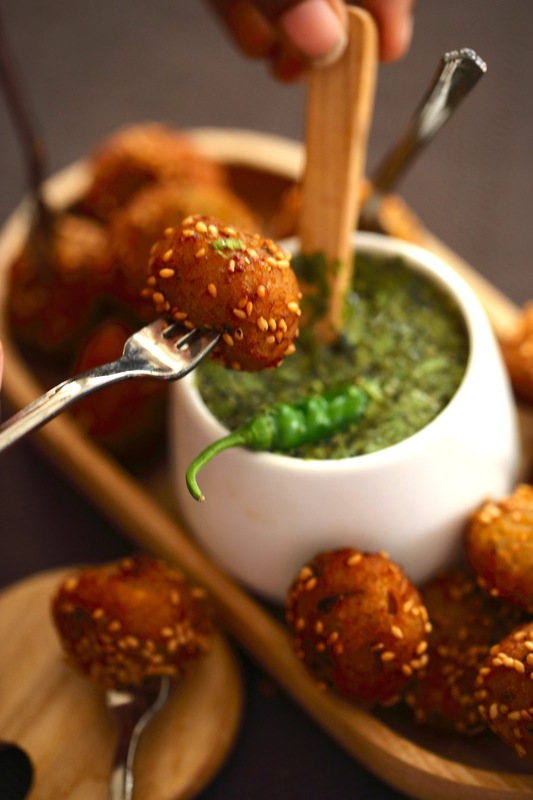 The grains used can vary a great deal - chick pea, tapioca, wheat, millets, oats and rice. We made our own combination which allows you to vary the flavor and density of the final product. 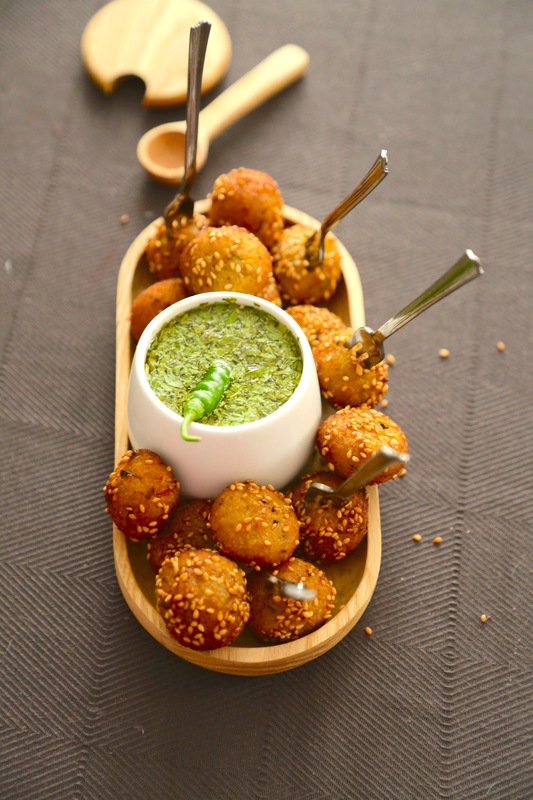 My grandmother used combination of jowar (sorghum), bajra (pearl millet), rice and semolina, it has a wonderful texture and tastes delicious with white butter and Lasnachi (garlic and chilli) chutney. Millet flours can be found at any Indian grocery. Some recipes require gram flour but I find it makes the thalipeeth too dense. The dough is flattened on to pieces of banana leaf. These come in uneven sizes so you may need to adjust the number you need. Always buy an extra one, in case you accidentally tear one. Thalipeeth can be prepared large, but I find it’s easier to manage a 5”- 6” disc of dough on smaller pieces of banana leaf. Use a flat griddle or non-stick pan if you don’t have a tawa and always cook it on low heat. 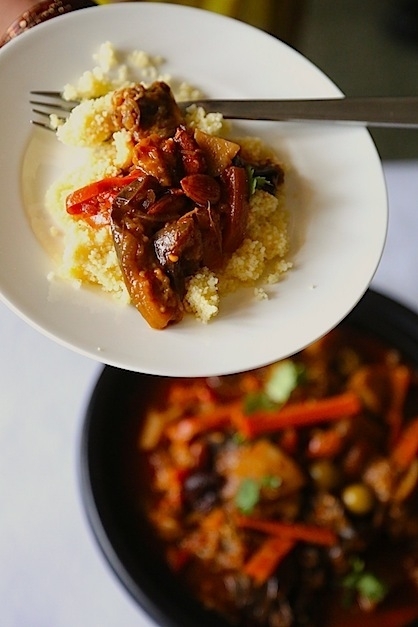 This recipe calls for rice semolina but you can also use wholewheat flour. Roast the flours and semolina in a non stick pan on medium heat for 4-5 minutes until fragrant. Stir in the semolina, cumin, coriander powders and salt into the flours. Add the ghee or margarine and the onions (omit if for a high holiday) and add extra cumin and powdered coriander. Roast 1-2 minutes, stirring constantly. Switch off flame and cool. Add green chillies, coriander leaves and ginger. Warm the milk or water with the sugar in a pan. Using your fingertips mix the warm liquid into the mixed flours to form breadcrumbs. Add more water, a little at a time to get a firm and pliable dough. Cover and let it rest for 10 minutes in a cool place. Break of a tiny little piece, the size of a peanut. Flatten and lightly cook in a pan. Taste for salt. If you like more salt knead extra into your dough. Wash and wipe the banana leaves very gently. Use a pair of sharp scissors to cut 8 rough squares about 7”- 8” along the both edges of the thick stem. The leaves should be slightly smaller than your griddle. Turn the ridged end of each leaf over so that the smoother side faces upwards. Place them one on top of the other. Reserve. Divide the dough into 8 equal-sized balls. Spread a banana leaf piece on a dry, clean surface. Brush with a little ghee or oil. Flatten a piece of dough in the centre of the banana leaf. With your fingertips and palm press downwards and outwards to form a thin, round, flat bread about 1/5” thick. Use a fork to dot the bread with holes. This will prevent the dough from puffing up. Put a smooth griddle or large skillet on low heat. 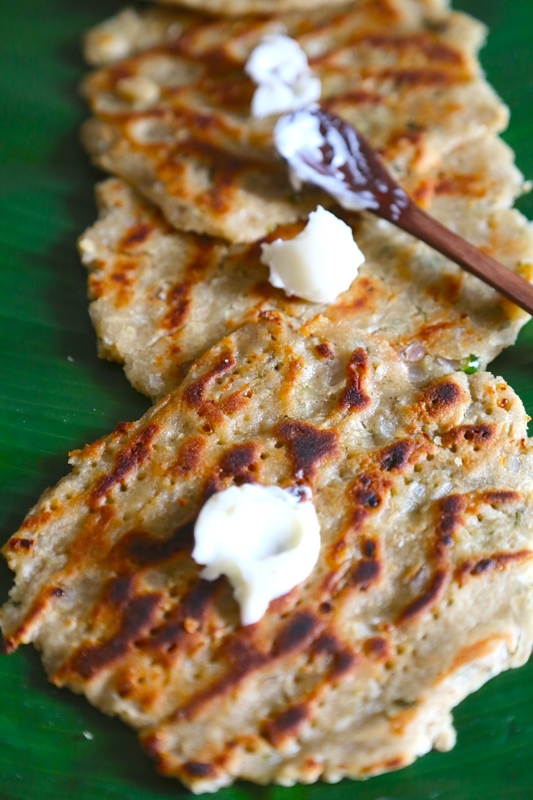 Pick up the dough with the banana leaf and invert it on to the griddle, so that the leaf is on top and the dough on the griddle. After 3-5 minutes of cooking, when the bread is beginning to dry, the steam will separate the leaf from the dough and you can peel it off quite easily. Thalipeet cooks slowly and requires patience. If you try to speed up the process by increasing the flame you will have a flatbread thats brown outside and raw inside. Cook both sides slowly, till dry and only very lightly brown. Once evenly light brown, spoon small amounts of ghee on both sides and cook till it turns a golden brown. Do not over cook or the bread will harden. Serve immediately with white butter and garlic chutney or plain yogurt. 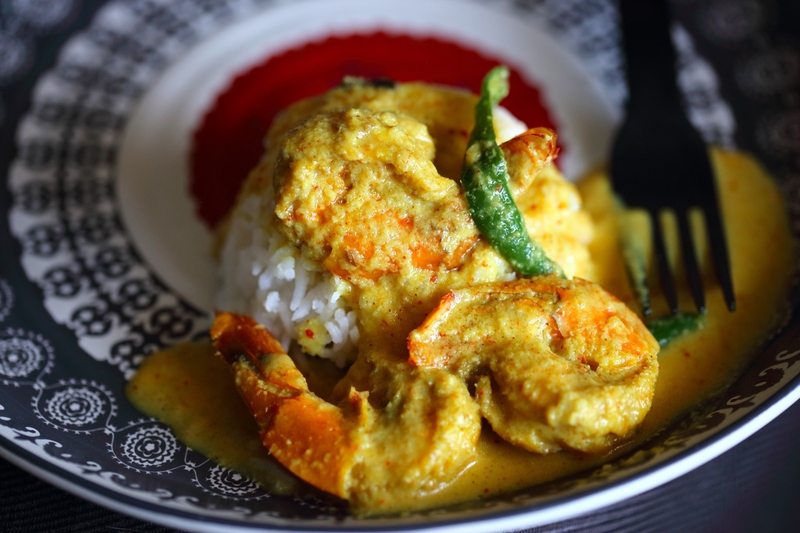 This classic Bengali curry is very popular during Durga Puja. Grind the coconut , cumin powder, cayenne and turmeric to a smooth paste. Reserve. Heat mustard oil on high heat. Add all the spices for tempering and cook 50 seconds. Lower flame and add onion. Saute until onion softens but don't brown. Add garlic and ginger paste and saute one minute until fragrant. Add coconut milk and green chillies and cook 2-3 minutes. Add prawns and coconut paste and cook until prawns are just edible. Add salt to taste and more red chilli powder if required.